Superformance ammunition pushes the envelope to deliver a walloping 100 to 200 fps increase in velocity for flatter trajectory, less wind drift and devastating terminal results. This advanced technological break through in ammunition design transcends convention and achieves the highest performance of any ammunition on the market today. 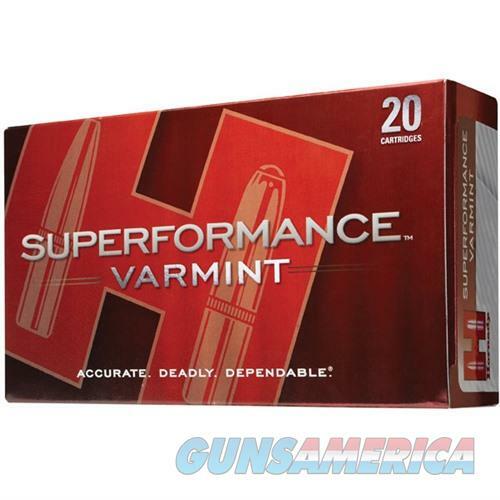 Features the polymer tipped Hornady V-MAX bullet for match grade accuracy and optimum expansion; the perfect varmint cartridge. Does it all without an increase in felt recoil, muzzle blast, fouling or loss in accuracy, plus is insensitive to temperature.